The source of several zucchettos on this site is a woman who found Father Kunst while doing a random search on the Internet. She was looking for a worthy place to donate the zucchettos she had inherited from her parents. Because of his interest and his collection she was assured they would be well taken care of. She gave them as gifts to him. They include this zucchetto as well as Pius XII’s and John XXIII’s. A zucchetto is a small skullcap worn by clerics of the church. It consists of eight panels sewn together with a stem on top. It was first adopted to keep the tonsured (shaved) heads of clergy warm in damp, cold churches but it has survived to the present day. All ordained clergy are entitled to wear a zucchetto. The color denotes the wearer’s rank: the pope’s is white; cardinals’ are scarlet and bishops’ are a shade of purple. Priests’ are black. Deacons are also entitled to wear zucchettos. The zucchetto comes from the Italian word, zucchetti, meaning a small gourd or zucchini and is indicative of its shape. Bishops wear the zucchetto throughout the Mass, removing it at designated times. 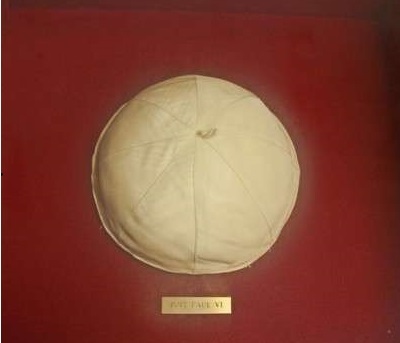 The Collection has a zucchetto from every pope from as far back as Pius IX, who reigned from 1846 – 1878. (Vatican Radio ) Pope Paul VI was beatified on Sunday October 19 by Pope Francis, thirty-six years after his death. In May this year Pope Francis had signed a decree to confirm that a miracle attributed to the intercession of this twentieth century pope had been recognized and that this beatification would take place during the concluding Mass of the Extraordinary Synod of Bishops of the family. Pope Emeritus Benedict XVI, who was created cardinal by Paul VI, was present at this event. On Friday morning the path to sainthood of a twentieth century pope was on the agenda for the third time this year in the Vatican press office. After John XXIII and John Paul II, now saints, it was the turn of Paul VI, Giovanni Battista Montini, a pope in- between the two. Gone down in history as the pope who steered and implemented the Second Vatican Council, the first pilgrim pope, the pope who gave away the triple crown symbol of temporal power, he was described by Cardinal Giovanni Battista Re who worked closely with Paul VI, as a man who had been very much misunderstood during his lifetime. The world he lived in was a changing one both at an ideological and political level, the cardinal explained, and the decisions he made were often met with psychological resistance from those around him for moving with the times. But thirty-six years on from his death, Cardinal Re highlighted, he is much looked up to. Highly cultured and acute, spiritually rich, humble and respectful of others whoever they might be, open to dialogue, he loved and served the Church and humanity and is now viewed as a role model. And as the vice postulator for the Cause of the beatification of Paul VI, Redemptorist Father Antonio Marrazzo explained on Friday morning, all is in place for the beatification: miracle and relics.The miracle attributed to Paul VI goes back to the 1990’s and relates to an unborn child from California in the United States whose name has not been divulged in an effort to respect the privacy of the family. The relics are two blood stained vests worn by Paul VI during the attempt on his life in the capital of the Philippines, Manila in 1970. The one habitually kept in his hometown will be brought to Rome in a reliquary for the beatification. There’s even a hymn composed for the occasion Father Marrazzo specified as he held up the photograph chosen to mark the beatification. A photograph in which Paul VI stands with his arms outstretched. He’s taken standing on the ‘San Pietrini’ as Rome’s cobblestones are called. A detail meant to symbolize this twentieth century pope’s evangelizing mission, that idea of his that all roads no longer led to Rome, that the time had come to bring the papacy to the people.